A tragic accident occurred in a rural area of Belgium. 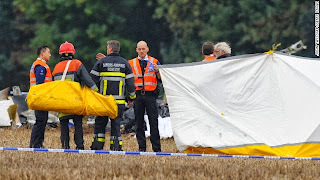 Ten skydivers and one pilot died on a plane crash, Saturday, October 19, according to the local authorities. Belgian Fire Service spokesman Eric Lambert told to CNN that they're rushed to go in the crash site in Namur to investigate and get the fatalities. The Mayor of Fernelmont, Jean-Claude Nihoul said, "According to witnesses, a part of the plane broke off, it nosedived and crashed into the ground like a stone." No one couldn't manage to escape from the crashing of small Pilatus plane. Nihoul added that three of the skydivers had tried to jump from the plane to save their lives but they were too late. For the meantime, please bookmark this page now or visit this site more often for you to be updated. You may also share this post to your friends so they may know about 11 people died on a plane crash. Comments or suggestions about "11 people died on a Skydivers' plane crash in Belgium" is important to us, you may share it by using the comment box below.